After years of debate, the Environmental Protection Agency is finally poised to revoke all uses of the pesticide chlorpyrifos, which first came on line as a pest control technology in 1965. That action, which could come this year, follows years of accumulating evidence that the organophosphate pesticide poses significant risks to people’s health and the environment. But Big Ag isn’t giving up on chlorpyrifos yet. Marketed by Dow Agrosciences under the names Lorsban and Dursban, chlorpyrifos was once widely used to battle insects in homes, gardens and lawns as well as in agriculture. In June 2000, however, the company agreed to stop selling it for household uses because of the health risks it posed to children. But its agreement with EPA did not extend to conventional agriculture, where chlorpyrifos is still widely used today. Research has linked the pesticide to nervous system damage, behavioral problems and lower IQ in young children whose mothers were exposed during pregnancy. In adults, low-level exposure to chlorpyrifos can cause nausea, headaches and dizziness, and farmworkers or others who experienced severe exposures have suffered vomiting, muscle cramps, diarrhea, blurred vision, loss of consciousness and even paralysis. In its latest round of pesticide residue tests on fruits and veggies, the U.S. Department of Agriculture detected residues of chlorpyrifos on some samples of fruits and veggies children often eat, including peaches and nectarines. EPA’s final ruling to revoke all uses of chlorpyrifos in agriculture, which has been years in the making, still has Big Ag in a twist, which was on display earlier this week at a hearing of the House Agriculture Committee’s subcommittee on Biotechnology, Horticulture and Research. In his testimony, Richard Guebert, president of the Illinois Farm Bureau, bemoaned the pending decision to remove chlorpyrifos from the toolbox of conventional agribusiness, claiming that without it the cost of production, and by extension the price of food, will go up. This ploy by chemical agriculture has popped up every time EPA moved to restrict the use of a pesticide in order to protect public health and the environment. 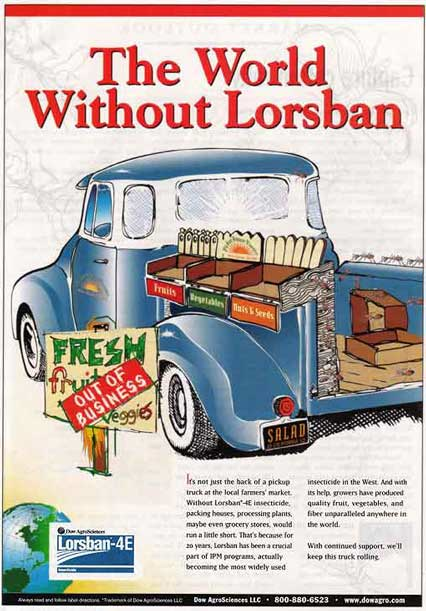 Years ago, the industry ran an add titled “A World Without Lorsban” that predicted a barren world devoid of fresh fruits and vegetables if chlorpyrifos were banned. So it comes as no surprise that Big Ag will fight to the bitter end to keep its grip on pesticides and other outdated and environmentally risky tools. Even in the face of overwhelming evidence that its practices contribute heavily to the problem of pesticide and fertilizer pollution of drinking water, conventional agribusiness regularly attacks both the research and those who dare to hold them accountable. The fact of the matter is that dozens of synthetic pesticides that were once widely used on food have been banned or otherwise phased out, and – lo and behold – you can still buy plenty of affordable fruits and vegetables in every corner of the country.